We started this project with the intention to create machines that organically enrich the experience of using public transportation. We worked with the fact that people naturally personify inanimate objects and assign them characteristics through projection. Our brain is wired to interact with human beings, and that is the way we make sense out of them. The more complex an interaction feels, the higher the probability is that we connect a certain behaviour to a characteristic pattern, which is the base for building a relationship. So even if we are mostly unaware of it, we form relationships with objects we interact with repeatedly. We decided to therefore use a very personality driven approach to our design to influence the perception of the machines in a positive way, by building positive personas for the ticket machines. We have created different personas for different machines, suiting the needs of different passengers and we have given each type of machine a specific character, which informs a lot of design decisions both within the industrial design and the UI flow. The creation of these personas helped us to identify the most important aspects about each machine and we discovered some unexpected characteristics along the way, which in the end made the result feel more defined and natural. Ingrid for example is a very small machine with a very streamlined process, providing shortcuts and suggestions based on a personal logged in experience. When we started out, we had this image of a small, nimble, fast and supportive machine. But going through the process of the character creation we realized that this machine would be small and fast, but also make a lot of decisions and assumptions for you in order to shorten the process. And it would not present you with the resulting suggestions in an elegant, subtle way, but straight forward and to the point. It would also not ask three times for confirmation, but trust the user that she knows what she is doing and move forward quickly. So in the end, the machines’ personality became more bold and unapologetic in a way, which we didn't expect. We went through this process for three different types of machines, and we ended up with three fully fleshed characters. They all have names, core motivations and key visuals, which shape their identity. We think this approach allows for a positive relationship between the passengers and machines, and we think both sides, passengers and Skånetrafiken, will be able to profit from that. To make everyone feel safe and taken care of. Make people understand the ticket system and learn about the machines. The Tourist. Travellers who are new or outside the current system and who do not use the app or a Jojo card. Overview and understanding of different possibilities. Providing the best solution for every possible scenario. Big stations and hubs, calm and "parking" areas. To make everyone happy. To make sure everyone knows where to get the help they need. Everyone. Passengers between multi travellers and tourists, who might know a part of the system, but not all of it. Overview and understanding of di erent pos- sibilities. Recognizing personal preferences and working them into new travels. All kind of stations, busy areas. To help as many people as possible to get to move as fast as possible. Multi-travellers. Passengers with a registered account, predefined shortcuts and service settings. Streamlined process to get pre-set tickets as fast as possible. Outside of stations, in public areas and busy areas. We used different design methods to arrive at our current family, some rather traditional, some quiet out of box. We worked our way from a holistic service blueprint through universal design and role play workshops to detailed character sheets and industrial design. Here is a short summary of how we did what and why. In order to understand the different contexts users might find themselves in before, during and after purchasing a ticket, we observed different type of stations and different kinds of behaviour. We mapped these behaviours to certain types of users and looked at the different use flows they require to identify contexts where these users with different needs might hinder or support each other. We used the comparison of those different use flows to identify specific areas within the stations and specific feature sets for machines. During our design process, we used different types and formats of workshops, to explore specific topics in more depth. We started with a universal design workshop, to which we invited professionals from fields such as urban planning, sustainability management and UX Design. We did not limit this workshop to only ideas around ticket machines but looked at mobility within middle sized cities as a whole. This workshop gave us a great introduction into a mindset we kept during the entire duration of the project. We used internal workshops with our team to take certain aspects in the design process to the extreme. We spent a whole afternoon talking about human-like machines, machines with character in literature and movies and personal stories about the border between human and machines and how we sometimes diffuse them on purpose or by accident. We discussed the sometimes comical and sometimes strange reactions that are triggered by machines trying to imitate human behaviour on purpose and the context in which those situations happen. This exploration helped us to define the behaviour of the machines. Not that we aimed to create a more human-like impression, but a specific unique behavioural language, which is not human, but still alive. When we were ready to actually define the individual character traits of our machines, we invited a big group of participants to help us. We collected character traits that the participants connected with other dominant appliances in their everyday live, and used them to build random machine characters. In different role play scenarios, we staged how these personalities might play out during the interaction between machine and traveler. This exercise gave us a great insight into how desirable certain character traits were to different users and how it influenced the behaviour of the traveller, with partly unexpected results. Throughout the process we made use of different versions of personas. During our research phase we mainly worked with personas, to identify needs along the user journey and to frame our findings. 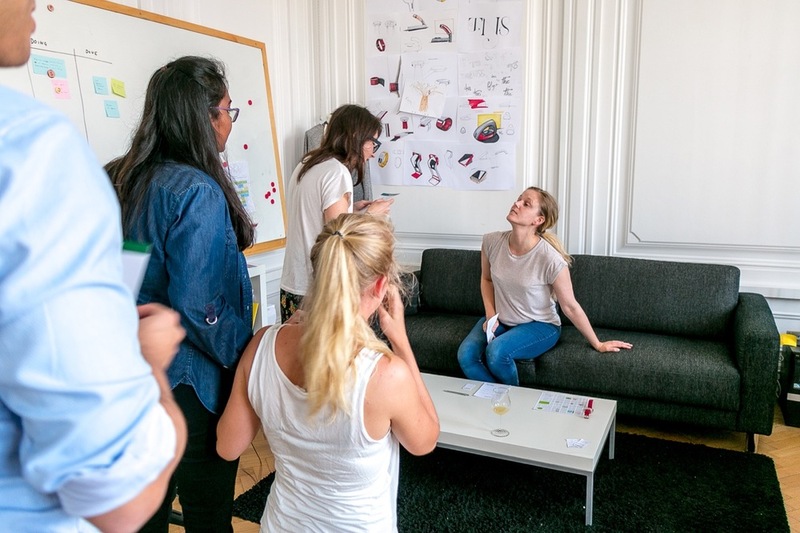 During the exploration and ideation, for example in the role play workshop, we used personas in a more playful way, as we re-shaped them as role play characters with certain weaknesses and secret super powers, which had to behave in a certain way and had specific constraints and goals. In the end, the final form of the characters of the machines were framed as persona sheets for each type of machine, with core motivations, basic needs, main interests, favourite passengers and a defined sets if character traits, which influenced details in the overall flow design and the industrial design.